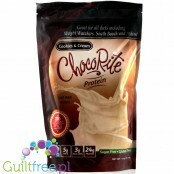 Packed with protein (20g per serving! ), The Piña Colada protein shake is a delicious low-IG snack that will give you energy for hours. Just pour water or milk and you can enjoy the taste of a delicious protein drink - minimal amount of calories, maximum taste and satiety! Weight net. 26.7g. ; 22,43 pln/100g. Mix yourself with the Piña Colada protein cocktail! You do not have to carry heavy bottles with protein shakers, you do not have to pack into a shaker training bag and measure portions of protein mix. ProtiExpress is the convenience and measured amounts of the mixture enclosed in handy bottles - unscrew, pour water and enjoy the taste! Each serving is 20g of protein in the form of a delicious shake. Thanks to the fact that you prepare it just before drinking, the protein it contains is better absorbed and is not destabilized (which may happen with some ready protein shake). A minimum of calories, maximum taste and fullness! 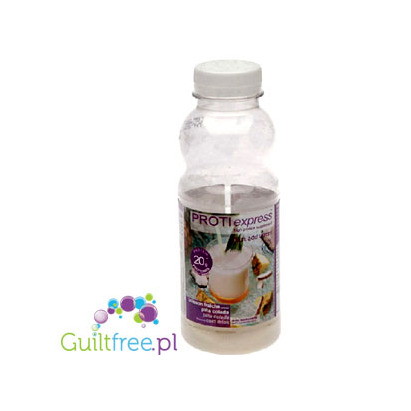 Used along with a low-calorie diet and a healthy lifestyle and regular physical activity, ProtiExpress protein shakes support the loss of body fat while maintaining a slim, muscular figure, provide a long-lasting feeling of satiety and prevent so-called the yo-yo effect. Ingredients: milk proteins, acidity regulator: citric acid, aromas, thickener: xanthan gum, sodium alginate (natural vegetable thickener), acidity regulator: potassium citrate, salt, sweetener: sucralose and acesulfame potassium, anti-caking agent: silicon dioxide. Contains sweetening substances: sucralose and potassium acesulfame. Allergens: the product contains soy and milk. May contain traces of eggs, celery, sulfites and gluten. Storage: store in a dry place. Preparation: Pour 120ml of cold water into the bottle (use the dipstick indicating the level on the bottle), stir gently with circular movements, leave for a few seconds. Add the remaining 130ml of water (use the scoop on the bottle), spin the bottle and shake the mixture vigorously to obtain a uniform consistency. Foam will fall after 5 minutes if you leave the bottle open. For a refreshing effect, add a few ice cubes and / or a peel of orange or lemon. For optimal taste and nutritional values ​​it is recommended to drink the cocktail shortly after preparation. Aromatyczny, gęsty, kremowy pudding o smaku czekoladowym z najwyższej jakości kakao zachwyca smakiem i zapewnia uczucie sytości na długie godziny. Jedna porcja to tylko 94kcal, i mniej niż 3g węglowodanów, a przy tym aż 18g białka! Intensywnie trenujesz? Odchudzasz się? Pudding DIETImeal PRO to idealny lunch lub deser dla Ciebie! 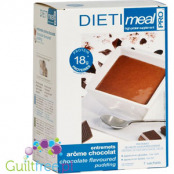 Sugar-free protein shake with chocolate cream: sugar-free, maltitol, low-fat, low-carbohydrate and provides up to 24g of protein. Delicious pancakes give energy to enter a new day and provide a feeling of fullness for long hours. 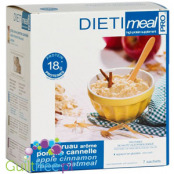 One serving is only 96kcal, and only 4g of carbohydrates, and at the same time as much as 18g of protein! Do you train intensely? You are on a diet? 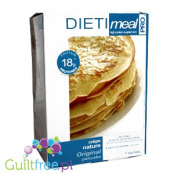 DIETImeal PRO pancakes are the perfect breakfast or lunch for you! Mix for the microwave. 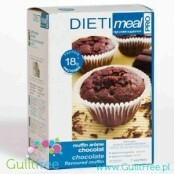 Fluffy, crispy from the outside and moist inside the protein chocolate muffins DIETImeal is the perfect breakfast, dinner or lunch for you! Delicious, delight with taste, give energy to enter a new day and provide a feeling of fullness for hours. 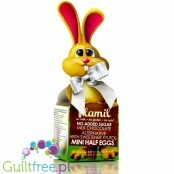 Vegan, gluten free Easter eggs with chocolate without sugar and no milk, sweetened with xylitol. Chocolate Plamil (47% cocoa) is one of the world's most refined chocolates produced with respect for the chocolatier tradition and fair trade. Its taste is the depth of chocolate ideal in the purest form. 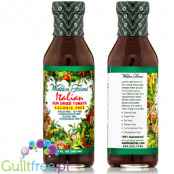 Invite the sun into your kitchen!Italian dressing with dried tomatoes will add flavor and character to every salad without overcharging it with excess calories! What is its most valuable ingredient? The sun, of course! They are permeated with sweet tomatoes ripening in its rays, dried in the mild glow of the south. Funky Flavors are sugar-free, fat-free flavors with intense flavors. Ideal for protein supplements, homemade protein bars, ice cream, diet cocktails, shakes, yoghurts and milk desserts. Concentrated aromas are ideal for giving intense, natural flavor and aroma.Cheesecake flavor. 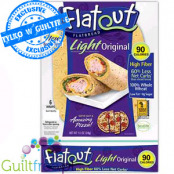 Flatout bread whole-wheat wraps7g of net carbohydrates, 9g of protein, 90kcalHealthy wraps with reduced carbohydrate content and high protein content baked from whole grain wheat flour using a traditional method.Delicious, aromatic wraps perfectly blend in with any filling and you can even allow yourself on a diet!